The House voted 220-191 on Friday to pass "Tax Reform 2.0" (H.R. 6760), a continuation of the tax scam passed late last year. The bill aims to make all of the individual tax cuts included in the first round of cuts permanent, and establishes a permanent cap on the state and local income tax deductions. Most of the individual cuts reduced taxes for the top 1% of earners, and the bill is projected to increase the national deficit by over $1.9 trillion. The bill passed the House even without the support of several GOP representatives in high-tax states who are against the state and local tax deduction (SALT) caps. SALT deduction caps can hurt middle income Americans, including seniors, who often have their assets tied to their homestead. This aspect of the bill will also harm many communities that use these taxes to provide services to their residents, often older Americans. U.S. Budget Deficit Swells to $898 Billion, Topping Forecast The U.S. budget deficit widened to $898 billion in the 11 months through August, exceeding the Congressional Budget Office’s forecast for the first full fiscal year under the Trump presidency. The budget deficit rose by a third in the October to August period from $674 billion in the same timeframe a year earlier, the Treasury Department said in a statement on Thursday. economic growth. The International Monetary Fund has warned the tax reductions risk putting the nation’s debt on an unsustainable path and could cause the economy to overheat. Before the CBO incorporated tax cuts and spending hikes into its projections, the group forecast the U.S. deficit would exceed $1 trillion by 2022.
outcomes and exacerbating economic and social disparities. The Medicare Rights Center opposes this harmful proposal. Policies must be changed to make health care and other essential services more accessible, affordable, and available to those in need—not less so. No one should be forced to choose between their and their family’s health and wellbeing and the stability of their immigration status and family unification. We urge the Administration to immediately withdraw this unconscionable proposal. them better manage costs. In addition, we urge practitioners to look into alternatives when drug prices or other health costs are unusually high, or when patients express or exhibit concerns about affordability. Earlier this year in our response to the Administration’s Drug Pricing Blueprint, we agreed that pharmacies should be allowed to proactively provide information about cheaper medications. We appreciate congressional action on this issue, and encourage policymakers to continue to pursue reforms that help people with Medicare better afford their prescriptions. Read more about this issue. Read our comments on the Administration’s Drug Pricing Blueprint. Read this bill. 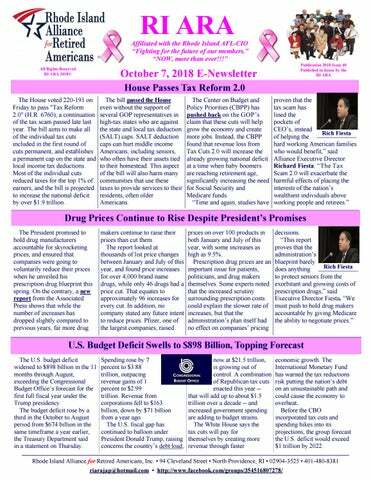 Special Report: Recent Changes in Law, Regulations and Guidance Relating to Medicare Advantage and the Prescription Drug Benefit Program Numerous changes were made to Medicare law, regulations and guidance during the first half of 2018.The changes are particularly noteworthy regarding Part C, governing private Medicare plans, known as Medicare Advantage (MA), and Part D, the prescription drug benefit.This report focuses on the impact to Medicare beneficiaries from changes to Parts C and D pursuant to the Bipartisan Budget Act of 2018 (BBA), a final rule issued on Parts C and D (CMS-4182-F), and the Final Call Letter for 2019. Current efforts and proposals will privatize Medicare and increase costs. While the BBA made a changes that impact both Against the wishes of most number of significant changes programs. Part II of the report Americans, some lawmakers to Medicare beyond Parts C and considers the potential impact of want to cut Medicare benefits, D, those changes are not some of these changes, driving up costs to you, and generally discussed here. particularly with respect to MA making health care and Instead, this report highlights benefits, consumer decisionprescription drugs even less many of the changes to MA and making and informed choice, affordable. Part D most relevant to and the impact of the changes We need to improve Medicare beneficiaries and on the traditional Medicare Medicare, not cut it. Let's those supporting or assisting program. renew it and strengthen it for them. Part I of the report generations to come. Protect provides a summary of these Print the full report Medicare. Don’t make changes, along with relevant America sick again. citations, and is organized by Medicare as we know it is Act Now! changes to MA, Part D and under attack. Social Security FAQs Why is Social Security so important? Is Social Security just for seniors? Why are Social Security’s protections irreplaceable? How important is Social Security for retirement? How is Social Security funded? Isn’t Social Security the cause of our large federal deficit? Where does Social Security’s surplus go? Isn’t the trust fund just a bunch of IOUs? Is Social Security going bankrupt? What’s the best way to solve Social Security’s long-range funding gap? Why shouldn’t the retirement age be raised? Should rich people continue to collect Social Security, or should it be “means-tested”? Some politicians say that Social Security’s COLA is too generous. Should it be reduced? What are the values that underlie Social Security? conditions. Azar’s speech also took aim at the “Medicare for All” national health plan sought by Sen. Bernie Sanders, saying it would undermine access for seniors and pile huge costs on taxpayers. The Trump administration is stepping up its criticism of the Vermont senator’s plan as many Democratic candidates in the midterm elections voice support for his vision of a governmentrun health care system. “The main thrust of ‘Medicare for All’ is giving you a new government plan and taking away your other choices,” Azar said. As proposed, the Sanders plan would cover all Americans. Taxes on individuals and employers would replace premiums, deductibles, and copays, and the government would set payment rates for hospitals and doctors. Sanders says his approach would uphold quality and gradually bring costs under control, but studies show it would translate to a historic expansion of the federal government’s role in health care. Critics doubt promised savings could be delivered. Critchley. Also among the findings was that poor diabetes control accounted for 15 percent of pneumonia infections and 16 percent of all deaths related to infections. "Pneumonia is very common and often causes death in older people, and we demonstrated a clear link to blood sugar control," said Professor Critchley. People with diabetes can control their blood sugar levels better through regular exercise, diet and maintaining a healthy weight, and taking medication when needed. Health experts can also help by carefully increasing dose of any medicines or adding new medications as required. just don't feel right.") may actually be more serious than for someone younger. Common conditions like urinary tract infections can present themselves quite differently depending on age, and treatments may vary. For these reasons and more, some emergency departments are making changes to tailor their care and better meet the needs of older adults. ocean without a life jacket. I still have days when I leave my job believing I have failed miserably as a teacher, a colleague or a friend. But I have also learned to cope, and so can you. I’ve gotten better at handling it. I know when I need to talk to a friend, relative or counselor. I’ve learned to find joy in everyday moments. You learn to laugh at yourself and at the absurdity of life. You learn to surround yourself with the people who love you unconditionally, support you and hold you accountable. For me, my faith is an essential component. You may find your solace in a myriad of different people, places or pursuits. Why the lies are dangerous: If left unchecked, these lies lead to the thinking, “It’d be easier if…” or “The world would be better off…” which can quickly escalate to suicidal thoughts. I know what it’s like to want to give up or to just quit. I know there are days when you feel like life is pointless. In the end, you would rather feel nothing than what you do feel. Please do not dwell on or give in to those thoughts and lies. Talk to a counselor, parent, trusted adult, teacher or friend. from depression, the way he now handled it was "markedly out of character for him," to the point of alarming her. "Not until after Robin left us would I discover that a sudden and prolonged spike in fear and anxiety can be an early indication of LBD," she explained. In the weeks before he was misdiagnosed with Parkinson's in the summer of 2014, Williams arrived home from a movie shoot like "a 747 coming in with no landing gear." In hindsight, she realized that this was the point at which her Julliard-trained, Oscar-winning husband was no longer able to hide his illness. The Parkinson's misdiagnosis made things worse because people with LBD respond badly to drugs prescribed for that disorder, Schneider wrote. "I will never know the true depth of his suffering, nor just how hard he was fighting," she lamented. "But from where I stood, I saw the bravest man in the world playing the hardest role of his life. Robin was losing his mind and he was aware of it." ideation. “Because many veterans do not use VA services and benefits, we must build networks of support, communication and care across the communities where veterans live and thrive,” the report states. The data was released a day before a scheduled hearing by the House Committee on Veterans’ Affairs. At the Thursday hearing, lawmakers are to discuss veteran suicide prevention efforts. The VA’s confidential Veterans Crisis Line is open 24/7 for vets and those concerned about them. The telephone number is 1-800-2738255.